This is my final evening in Los Angeles. 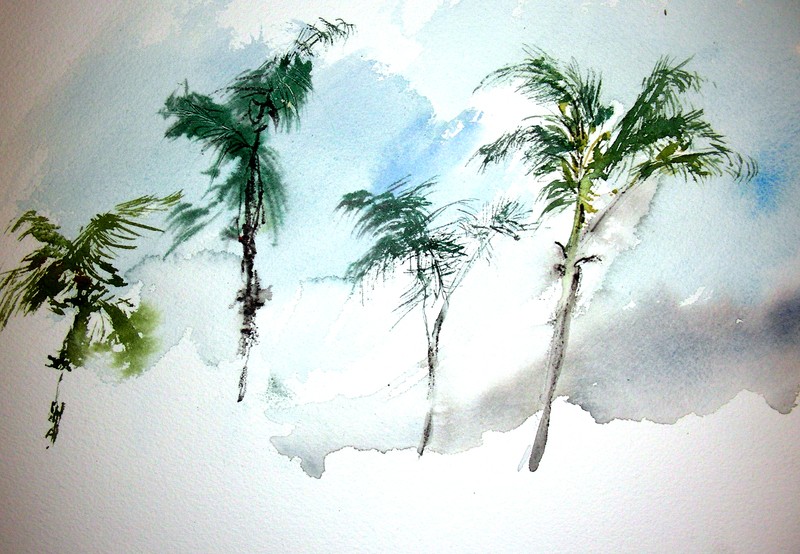 I decided to set up one more time for a crack at the palm trees. After doing these two sketches, I felt fatigue setting in. I’ve was in meetings all day for International Baccalaureate Diploma training Saturday and Sunday. Friday I was wearied by rising at 5:00 a.m. and flying to the West Coast, retiring to bed around midnight, west coast time. It has all caught up with me! 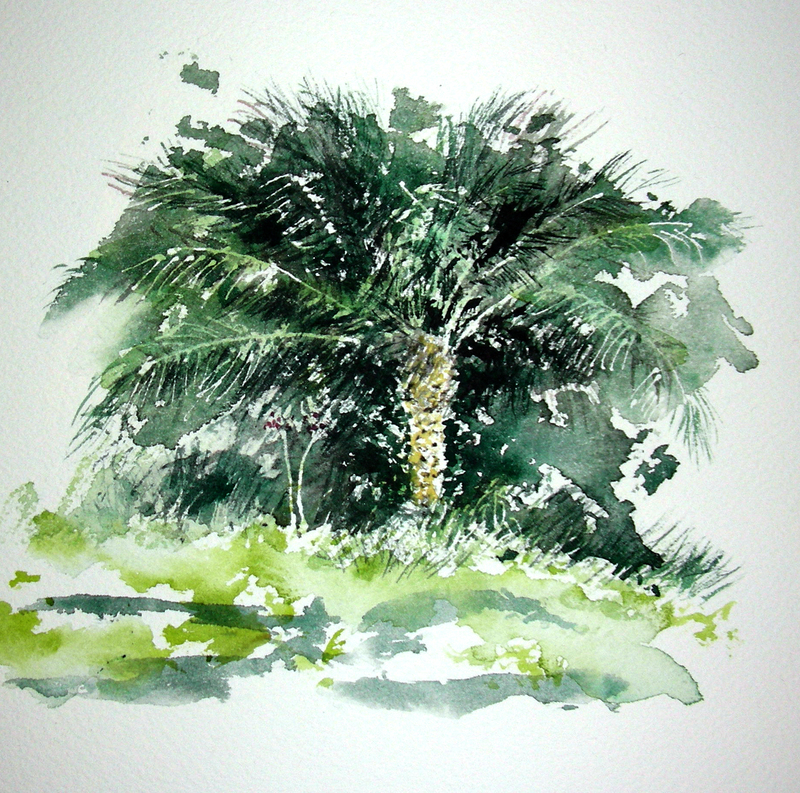 At any rate, I’m grateful that I was able to get outside in the sunny climate three consecutive days to capture some palm trees with a combination of dry brush and wet-on-wet gestures. Tomorrow I return to Texas. I’m in the midst of a fabulous four-day conference in Los Angeles. I’m training for the International Baccalaureate Diploma Program which will be coming to my high school in 2012. After the conclusion to today’s sessions, I took the trolley from the Sheraton Gateway Hotel near the LAX airport to Manhattan Beach, with about an hour of sun left. After struggling with a row of storefronts, I decided to abandon the architectural sketches and see if I could generate something with a row of palm trees along the boulevard. I was thinking of the principles of painting expounded by the 6th-century Chinese historian Xie He. I’m not sure that I’m translating his ideas correctly, but from #1 and #3 I have come up with this idea of trying to capture the essence, of the subject under scrutiny. 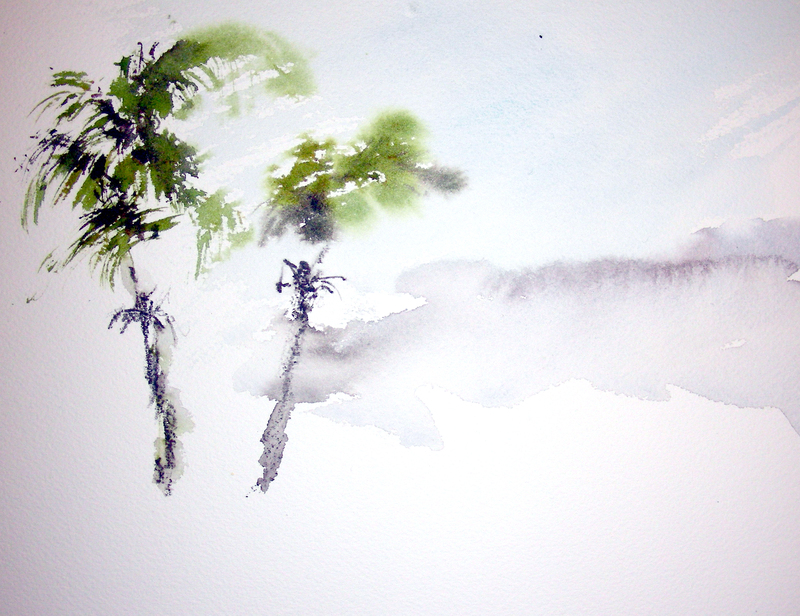 I only had about ten minutes of daylight left when I began these two watercolor sketches, but I think by working quickly I was able to get more quality onto the page than I did with my first palm tree attempt yesterday at poolside. Hopefully tomorrow I can give it one more try before returning to Texas. The attempt I found very rewarding, the sun was pleasant, and the breeze coming off the Pacific was scintillating, to say the least. 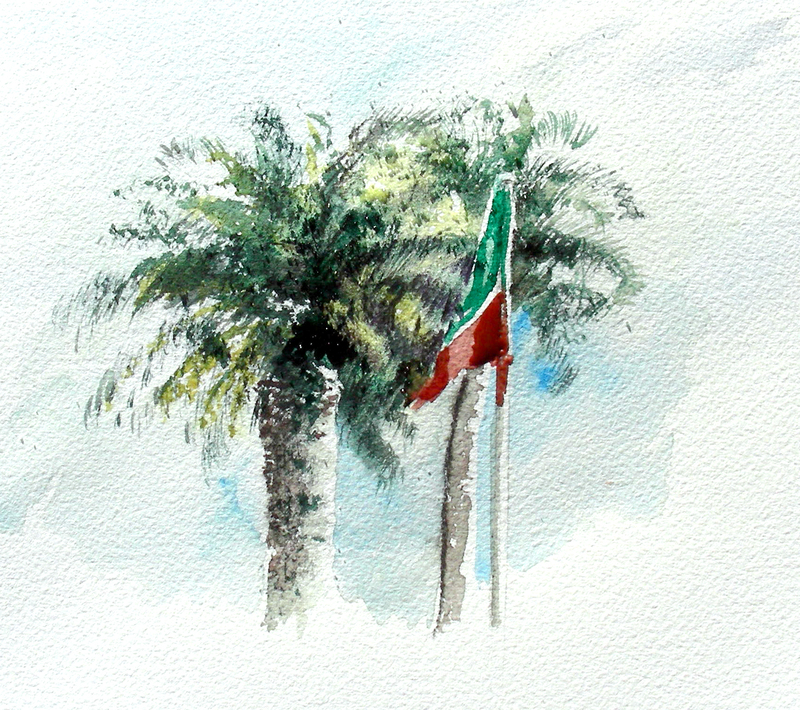 This was my first attempt to watercolor a palm tree. I only had 20 minutes to do it as I sat by the pool at the Sheraton Gateway in Los Angeles in the early evening, just before the sun disappeared behind the fence. I was using what I call my “ugly brush”–a modified flat brush that I had carved up with an X-acto knife to create a ragged wall of bristles. 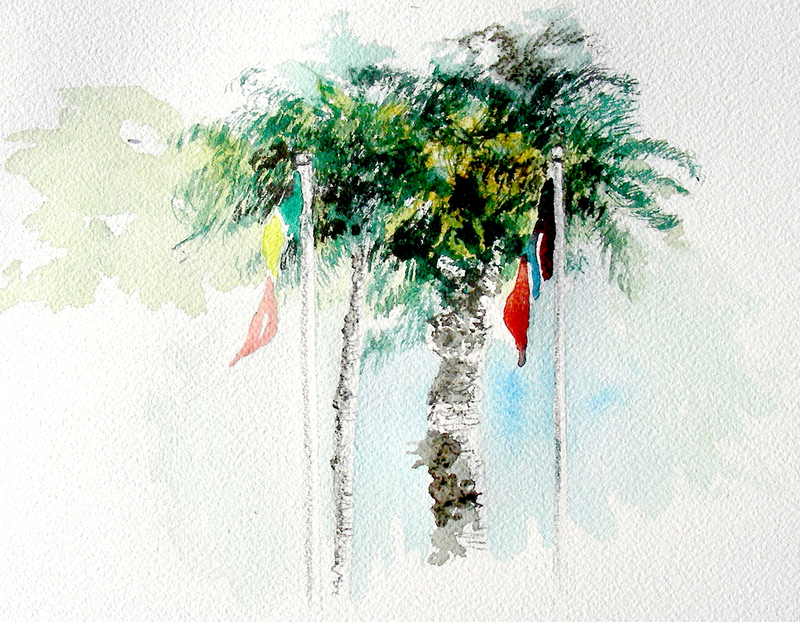 My final of three quick watercolor sketches. I only had an hour before the sun was down. I worked as quickly as possible, trying to capture the sun-washed facades of these storefronts, one block from the Pacific Ocean. I am pouring my heart into this composition, which overall measures about 19 1/2 by 22″. My reason’s for painting this defy words, but I’ll give it my best effort. I saw this sign daily on a billboard during my pre-literate days. I was travelling in the car on old Highway 30 from Fenton to St. Louis. A billboard advertising this diner was alongside the bridge over the Meramec River. Though I couldn’t read it, I was taken with its color scheme, and always looked for it on the drive. During my teenage years, when I learned to drive, I was surprised to see this diner (and its sign!) on Kirkwood Road. My dad worked at a dealership north of this location, and thus I saw it many more times when I would drive to see Dad at his workplace. I guess I’m trying to say that there is something “Proustian” about this sign–it takes me back to images and remembrances of my childhood, which are warm and inviting. I have lived in Texas since 1977, and travel to St. Louis only to visit family. In the 1990’s, with a 35mm camera, I drove to this location and took a number of photos, then went inside for the first time, to eat. 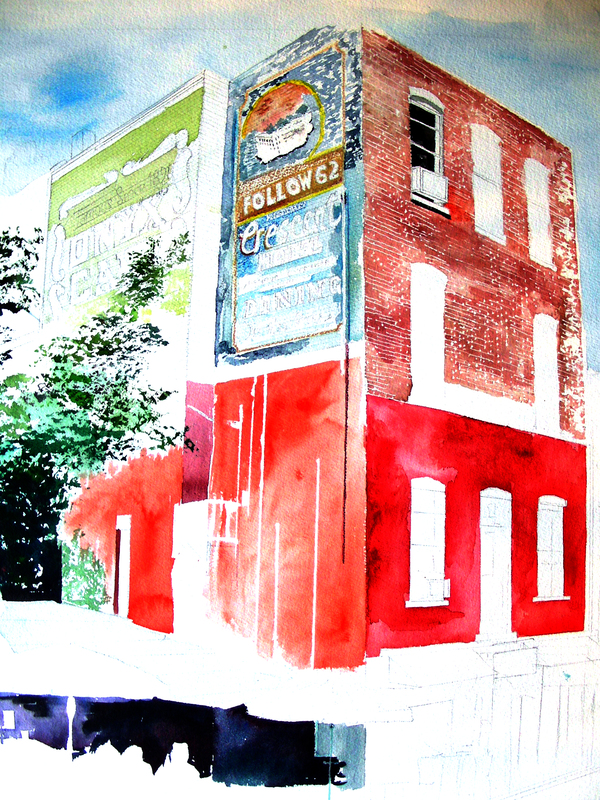 I couldn’t believe I waited thirty years to enter the establishment (and now have waited over fifty to paint it!). Once inside, I felt that I had entered Edward Hopper’s painting Nighthawks. This cafe began just five years after Hopper painted that work. Sadly I note that these diners are getting harder and harder to find. I settle for Starbuck’s, but wish for Spencer’s Grill. I guess as artists, we always call ourselves “visual persons.” But I cannot stop staring at signs and logos that I saw before I was able to read them, and was captivated by their designs–Chevrolet, Ford, Texaco, Sinclair, Maxwell House, and of course, Spencer’s Grill. There remain (for me) certain color schemes and selections of fonts that I cannot stop staring at, and probably will continue to do so till the end. So, to any of you who have warm memories of old-style diners from your “pre-literate” youth, I hope you will enjoy this one. I’m feeling a great sense of reward and fulfilment as I work on it. What a delicious space of time! Today we finished our “Fall Semester” in Texas Public Schools, and the “Spring Semester” does not begin until next Wednesday–a four day weekend, so close to the Christmas holiday break! After quality time in a cafe this afternoon with another artistic spirit, I felt “juiced” to resume painting over this long weekend. So . . . after a late-afternoon “refresher nap” (my brain is fried from finishing up a high school term today, while just last night beginning my first Spring Semester university class), I was ready to re-enter the studio and resume this piece. This is a full-size sheet of watercolor paper, 300-pound rough. Finally I am escaping the feeling of “lostness” with such a large expanse of space in which to operate. Time this evening has indeed evaporated, as I began working on it shortly after 7 p.m. and now it’s 12:38 a.m. I feel like I’ve only been fiddling with it an hour or so! That’s always a great feeling to me, getting totally immersed in a watercolor. While working, I’m listening to The Teaching Company’s series, “An Introduction to Greek Philosophy.” I have gotten through the Pre-Socratics, the Sophists, Socrates, and now am listening to lectures on Plato’s Dialogues. The lecturer is really engaging, and I’m surprised at how much I’m absorbing from his subjects while focusing on this painting and solving various problems. Tonight I worked on the colorful umbrellas, finished all the windows and door on the larger building, and continued refining the ghost sign with all the lettering, coloration and brick textures. I’m getting ready to dive into the front awnings, main restaurant sign, and display windows on the front of this business. Perhaps tomorrow I’ll finally get to the people seated beneath the umbrellas (the part I’ve dreaded most in this entire work–those of you who follow my blog know that I don’t “do” people very much in my paintings!). It suddenly dawned on me, while writing this post, and looking to my right at this painting, that I could conceivably finish this large piece over the long weekend. That thought had never occurred to me until tonight. It would be great to get it behind me, because I already have two more compositions waiting in the wings. This may be my first mention of this–I’ve been offered a show in September, my first. I’ve been in a good number of group showings, but never one of my own. It has always been a dream of mine, and now that the time is finally on the horizon, I’m excited about pursuing new work, and plenty of it. 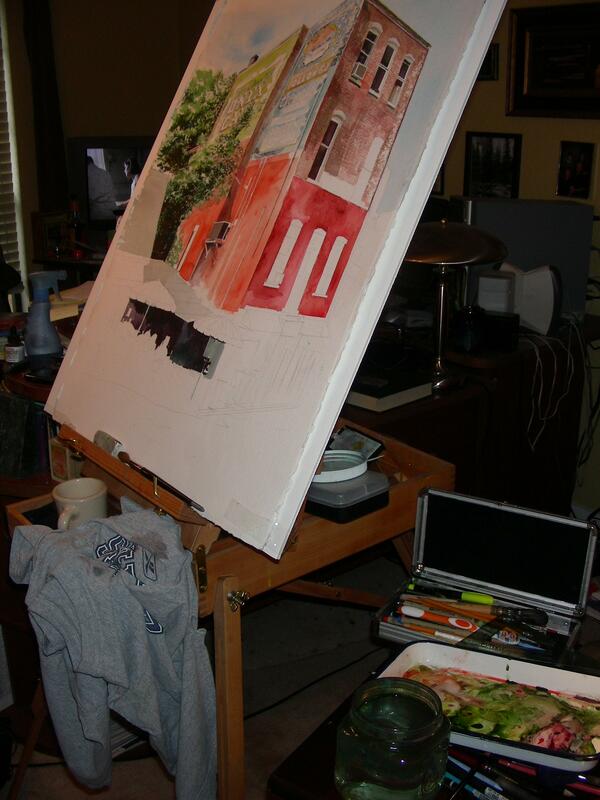 O. K. time to get back to this Eureka Springs painting. 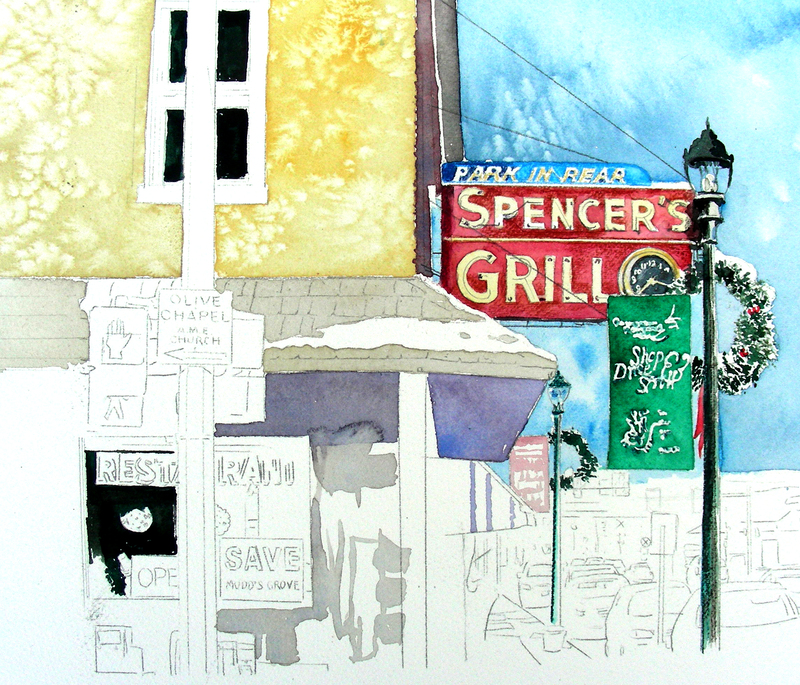 I’ve been offered a class again this summer at the Eureka Springs School of the Arts, teaching plein air watercolor. I really hope the class makes–teaching it last summer for the first time remains one of the highlights of my entire artistic journey. The town is beyond belief for anyone who wishes to capture it en plein air. What a sublime day! A rare winter storm has moved through north Texas, dumping several inches of snow and dropping our temperatures to freezing. I could not work in the garage today, so I moved my French easel back into my already-crowded study, and resumed work on this large, full-sheet of watercolor paper. Yesterday I was offered my first gallery show, to be scheduled in September. The offer provided a spark plug to my already-revived interest in painting. The next four months seem to offer more painting time for me, and I’m delighted to have this eight-month heads-up to prepare for a show. I’m pulling together a number of mid-size to full-size watercolor compositions and hope to be painting on them within the week, as our high school spring semester draws to a close and we move into a brief winter semester break. I cannot get over the vista outside my window as the snow continues to blow about, filling the sky. The coffee is sublime. I have the motion picture Pollock playing on the TV inside my study. I don’t know how the day could get any better. The Texas weather was in the upper fifties today, and the sun was bright. I raised my garage door, and whittled some more on this work-in-progress, enjoying the bright afternoon sun on the paper. This is a full sheet of watercolor paper, and I’m not used to working on so large a scale. I’m getting lost in the painting! I photographed this quaint historic district of Eureka Springs, Arkansas repeatedly when I was teaching at the School of the Arts last June. I have gazed at the photos numerous times, and decided it was time to get daring and try a large piece. I’m enjoying the ghost signage, the plumbing and cables outside the old brick walls, the painted bricks, and the brightly-colored umbrella tables down below that I plan to tackle tomorrow. 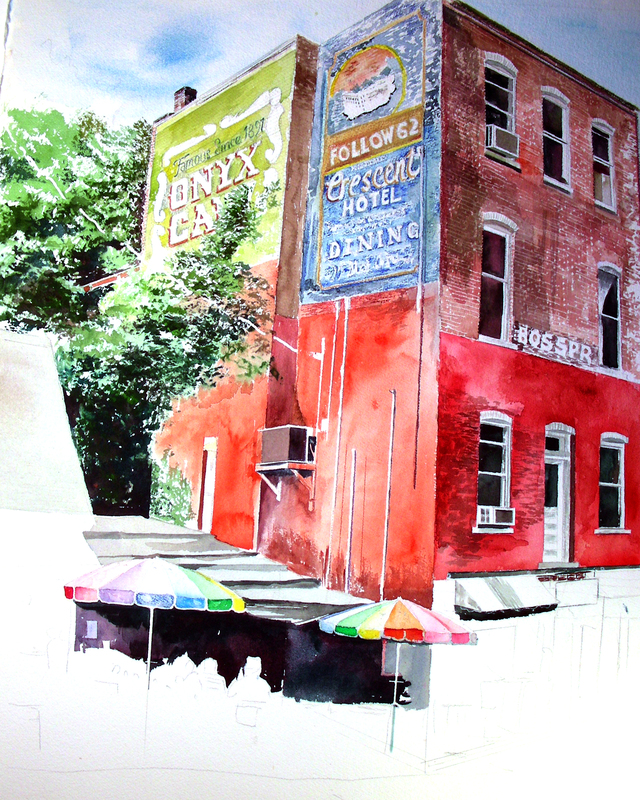 If I can pull this one off, then hopefully I can return to Eureka Springs this coming summer and try to paint en plein air this same district. I’ve been offered a position teaching there again in June, contingent on the class making. 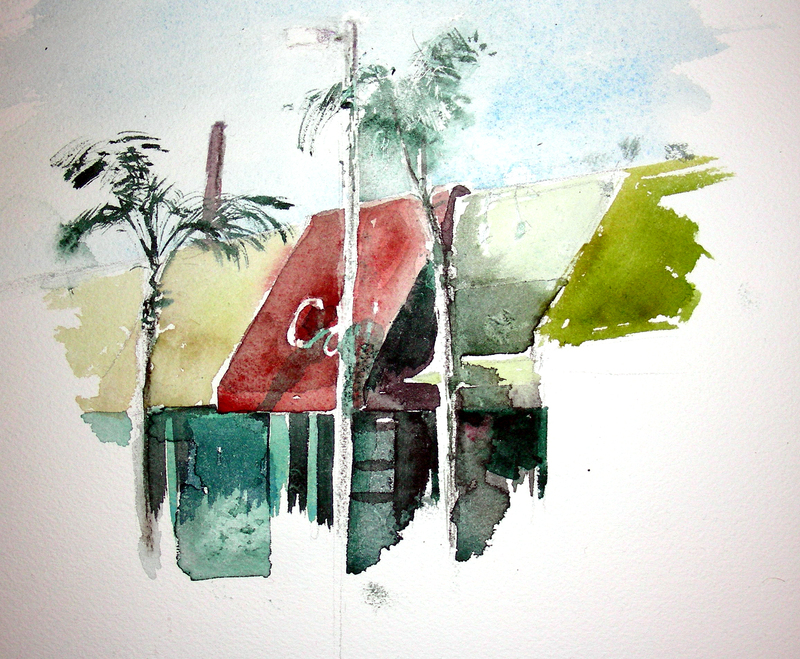 Last summer was quite successful, as I taught plein air watercolor in the town. I would love to do it again. 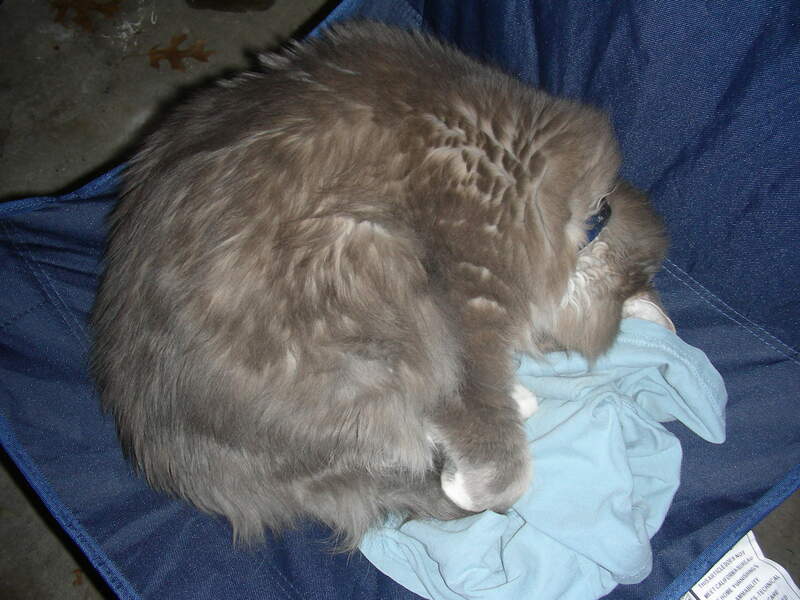 For those of you gracious enough to read my blogs, I hope to kick up my activity to a higher gear. It appears that the next four months are going to allow more time for painting and blogging. School got pretty tight last semester, but the approaching spring term appears to be a little lighter (I hope it will be, anyway). In 2010, there were 186 new posts, growing the total archive of this blog to 205 posts. There were 232 pictures uploaded, taking up a total of 683mb. That’s about 4 pictures per week. The busiest day of the year was November 8th with 246 views. 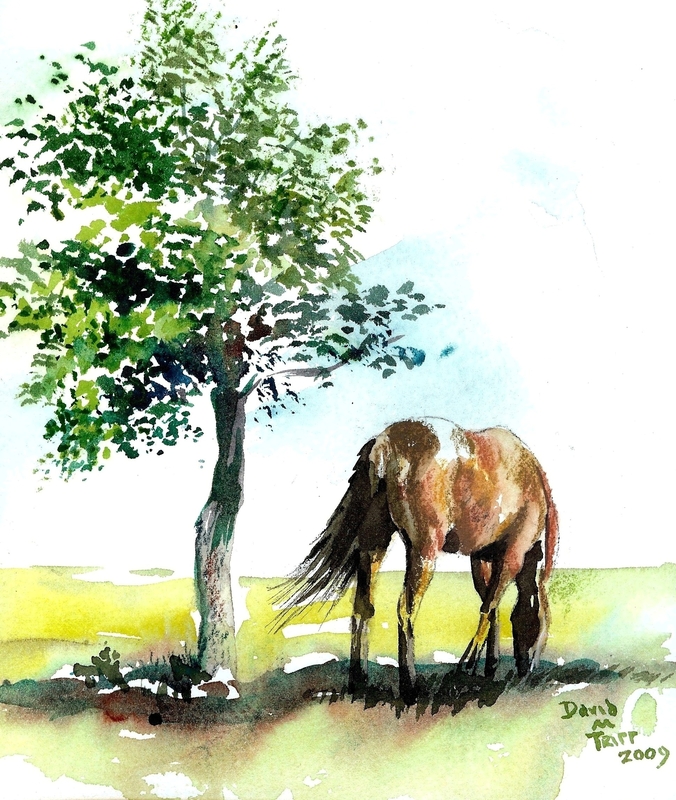 The most popular post that day was Impressionist Horse, January 26, 2010. The top referring sites in 2010 were facebook.com, recollections54.com, en.wordpress.com, webdesignschoolsguide.com, and mail.yahoo.com. Some visitors came searching, mostly for horse, andrew wyeth, union pacific 844, watercolor, and jazz. Happy New Year to anyone who reads this. I have just returned from a St. Louis Christmas holiday, and though the family activities kept me busy, I did find a brief opportunity to paint. My eye was filled with wonder the entire six days I spent in the midst of the snowy Missouri winter. One of my profound blessings of recent months was renewing a friendship with Wayne White, a classmate I knew since second grade but lost contact with following high school graduation. Thanks to Facebook we found each other again. Wayne is a farrier who works on his beautiful spread at Double D Acres in Labadie, Missouri (not far from historic route 66) southwest of the St. Louis area where both of us grew up. You can read all about his life and work at http://www.doubledacres.com/. Wayne graciously put my wife and me up in a comfortable apartment on his ranch, and we spent a quality morning with him in the frigid barn temperatures, watching and photographing as he worked, shoeing one of his horses. I was not going to let this opportunity pass. It was frigid cold outside, but the view through the kitchen apartment door was fine enough for me. I laid my supplies on the table, held the block in my left hand, and sketched, brushed with my right. I only spent about 30 minutes on it (a small 8 x 10″ sketch), but was happy with the results. I am back home now in Arlington, Texas, in my garage studio (man cave! ), with the door shut because of the 35 degree temperatures. I finished this work a few moments ago, adding only the tree trunks and their shadows at the bottom of the page. I believe that is all this needs. Hopefully I can work on some more snowscapes this winter, if not from Texas landscapes, then from photos I took while in St. Louis this past week. Meanwhile, in the company of my sleeping cat, I believe I’ll move on to another watercolor.